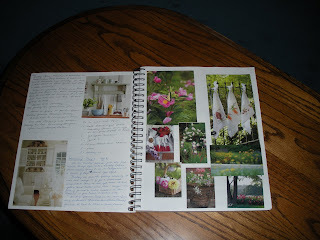 Ann has been writing a series of posts on Journaling. They are inspiring and beautifully written. They will make you want to run out and purchase a blank book and get writing. I kept a Journal for years when my children were younger and still at home. I poured my heart onto the pages and a little stack of floral covered books grew on my closet shelf. One day, after reading through a few of the entries, I decided that I really didn't want anyone else to read them. Some of the things might be hurtful taken out of context; some things just really didn't need to be shared with anyone else. So I sat on the floor and for several hours tore them all to bits. I had a couple of large garbage bags filled with the remnants of years of journaling when I was finished. I wasn't terribly sad. I knew it was right. They had served their purpose. They had given me a place to record and sort through the things we were walking through in those years. 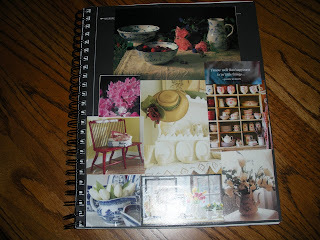 I decided that from then on I would keep a more "generic" sort of Journal - nothing too deeply personal. It worked well for a while, but over time I found I couldn't really write about my daily life without my "heart" making its way onto the pages. When I begin to put words on paper, they seem to take on a life of their own. I have managed to install a little "editor" that makes sure I don't write anything about a person I wouldn't want them to read. Other than that, my Journal has once again become the place where I process my life. This is my current Journal. I got the idea from Ann. It is my second sketch book that I have fashioned into my Journal. The first one was much smaller, and I found I wanted more space to paste pictures and write. So I bought a bigger one the second time around. 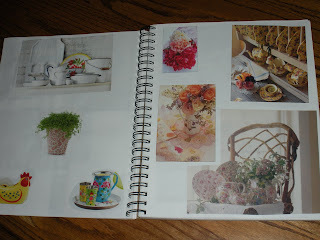 I decorated the cover with pictures from my magazines. This is the very first page. 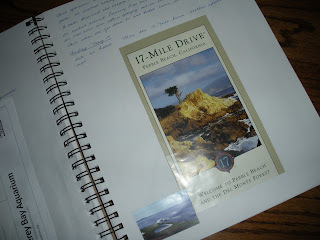 I use my Journal to write lists of things I want to get done during the day, to record the noteworthy events and special occassions - like our trip to California. 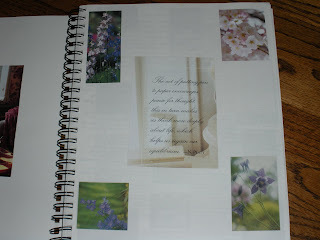 I saved bits and pieces to paste into the Journal as we traveled. I also record my thoughts, quotations that are meaningful to me, prayer requests, and little conversations with the Lord. I also incorporate my gratitude list as I write and then mark them with a little heart so I can easily find them when I glance back. Sometimes I have so many pretty pictures I just fill the pages with them. I have also started a little Jounal that I use during my Quiet Time - to record what I hear the Lord speaking to me through His word and to write out my thoughts. There is something about the act of writing things out that settles and defines them. My blog is also a Journal of sorts. The things I post lately are things that I want to remember - things that have touched me in some way. Often they are just simple little things, but I have found it is easy to lose the memory when we have so many other things bombarding our minds on a daily basis. I especially want to record the things the Lord is showing me. I am setting down markers along the way so I don't forget those things. I want to remember the blessings and the joys and the simple pleasures He so graciously pours into my life. I want to remind myself of His faithfulness so that when life gets difficult, as it inevitably does, I will be encouraged by the things He has done for me in the past. I also want to remember the answers to prayer. So when I write, I am really writing to myself because I always think I will never forget and then I do. I love words....they hold such potential for good. I want to use them wisely. Oh, I do think if we knew each other in person, we would be great friends. I so identify with all your posts, especially this one. The only problem is, I don't know how to quilt, lol. Thank you for your blog, which continues to be a bright spot in my day. I have many notebooks full of thoughts I wrote down when the kids were little - I should read them one of these days. Wonder what I'd need to tear up and throw away! I love your beautiful journal - and I love that you do some of it here for us all to enjoy and appreciate. Have a happy 4th/BD party! Thank you so much for your sweet comments. I look forward to hearing from you too. I don't know how to contact you in any other way - so I hope you will read this little note. You are a blessing and I am holding you in my prayers. Oh - and I am just a beginner quilter. I am learning at the feet of a master quilter - my sweet Mom. Have a blessed weekend Loretta. What you do with your journal is so cool! What a way to capture the things that touch your heart! I have been keeping journals on and off since fourth grade...and I have to say that I have gone back and torn out certian pages. Now when I write, I try to imagine I am writing to be published for history's sake one day. Ha! This is the reason I started blogging in the first place - to have an easyway to keep a journal. Some of my posts that are perhaps dull to others (they must be since they get no comments!) do need to be there just to record an event. I love your words; "I want to remember the blessings and the joys and the simple pleasures He so graciously pours into my life. I want to remind myself of His faithfulness so that when life gets difficult, as it inevitably does, I will be encouraged by the things He has done for me in the past." Your words are such a gift and I always feel inspired after I read your blog. Thanks for sharing and for your special insight along with your inspirational words. Like you I have certain journals that have had pages ripped out. I also find the depths of my soul making it into the pages of my journals in black and white. Somehow I failed to link to your new place here (it was in the middle of settling in with our new little guy). I have now remedied that and you will be seeing more of me once again!! SORRY!! I was sad to think of your words being torn up, but I understand. I love the idea of using college to journal with. Maybe i will give it a try. Nice Idea for a journal. I too felt sad about you tearing up all those pages, but we would never want to worry about anyone being hurt by something we have written, so I'm sure it was for the best. For some reason, my journal has been sitting untouched for a couple of years now. For some reason, I lost interest but you may have spurred me to pick it up again. I used to journal and threw many of mine away for the same reason. Now I blog-it seems like almost the same thing. I'm a quilter and a nana to 7 almost 8 and love this season of my life. I popped over from Ann's and glad I did, I'll be back again. "the place where I process my life." Oh yes. I love it. I love your journals, they are beautiful, a reflection of you. I too, love to journal and appreciate the process of reflection. I love this idea... I also tore out journal pages and put them through the shredder before our big move. I still like to record my thoughts so I confine them to my blog for now.